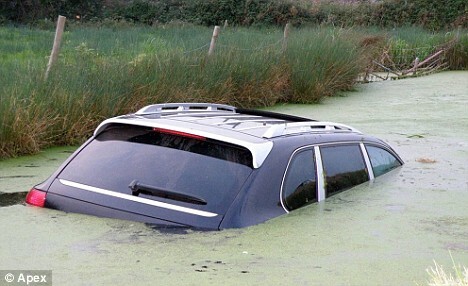 The driver landed the luxury 4x4 window-deep in water after dramatically careering off the road to avoid a deer. Although he managed to scramble free without injury, he was seen by local residents receiving a few stern words from his wife who owns the car. The two-year-old dream car was left submerged after the accident at midnight near Burnham-On-Sea, Somerset. An Avon and Somerset police spokesman confirmed no-one had been injured in the incident.